As usual, I was doing my routinely checks on the locations last week. I have a location which I just visit once a month since it is an office building where there are not many customers using the machines. I was casually entering the location but the doors are locked and there is a security guard in front and was asking questions about my business. The security let me in and I was out in 15 minutes. Security told me that there was a shooting incident among employees or something. Sometimes you will be wondering if you need to retain an extremely weak and slow location? Common sense will tell us that if the location is out-of-the-way then better get rid of it and sale it as a discount, but be sure to tell the prospective buyer that the location is slow performing. You can sell the machines and advertise it as a free location in that way if the buyer is finding location for it then it will act as a free storage and for the meantime generating some revenue. There was a show in PNE GemShow which I have attended on that Sunday and I bought a singing bowl. The singing bowl comes in different size and shapes and it resonates a certain frequency on a certain size of the bowl. The singing bowl I got was from Nepal where most of the populace likes to meditate to create a stronger union of the mind and body using ancient sound frequencies. The singing bowl I chose was for aligning and healing the lower chakras. I guess 15 minutes a day will be good to start the day. I proceeded to a public location which I just visit bi weekly ( every other week ) and I have three ( 3 ) machine in that place and I was wondering how come there was one ( 1 ) machine that there are no sales? You sometimes know the Healthy Max machines coin return button gets stuck and does bounce back which is a common occurrence with these machines, other than that I have no complaints for the sturdy healthy maxes. I panicked on that moment and thinking why I do not bring tools with me whenever I go downtown? 3 I get paranoid if there are a lot of products inside my work van when parked in Vancouver. 4 I suddenly had a quick fix to the problem so that the coin return button will not stuck again. 8 There are a lot of things that happens in one ( 1 ) day every day for me when I’m out doing the vending machine business. Probably deep breathing exercises should do the trick! 9 The Payrange is not compatible to Nayax. At least the ones mentioned above is the absolute minimum maintenance tools to bring. I stop bringing these tools after the vandalism incident on my work van. I’m always in panic mode whenever I’m in downtown and generally the vicinity of Vancouver. I get paranoid if there are a lot of products inside my work van when parked in Vancouver. Statistically it is where most of the vandalism that takes place even in broad daylight. I suddenly had a quick fix to the problem so that the coin return button will not stuck again. Here is the picture that describes by itself. You just have to insert a roll of cardboard from your chips box and insert it between the coin mechanism and the lever. See the picture below. I headed to one of the Goliath location. And I was surprised why the gigantic snack vending machine was almost empty only within a week’s time? The guy inside told me that they have night shift’s now due to high volume shipments. It is a good thing also that this location did not call me on stuck Noodles since they took care of themselves. Using a clothes’ hanger on stuck noodles on the delivery bin is acceptable for me. The people there are quite friendly and honest. Most of them are my fellow country men and never complained about work even thou it is very laborious, long, heavy and a sweaty daily job. I guess doing this kind of work keeps your body healthy in a way. Just have to know the range of motion when loading, unloading and moving. If you do not know the proper range of body movement then you will surely get back injuries and a lot nerve problems with your hands and feet. There was a location in North Vancouver that called me several times and complaining loud noise coming out from the vending machine. In most cases according to my experience it is the ventilation motor that is usually giving out a loud noise on a combo or snack vending machine. I also know that the machine is about 10 years old and the probability would be the vent motor. I reached the location since it is across the bridge in Downtown Vancouver and had a quick fix just by unplugging the vent motor power cable. You do not need a ventilation motor to have a functioning vending machine, you can do away without it. If you buy the vent motor it will cost you hundreds of dollars on parts, labor and especially the time factor in moving the machine to disassemble the re assemble and bringing the motor back and forth your local vending machine supplier. Simple fix to remove noisy ventilation motor is by unplugging the molex type power cable. See the picture below. See the picture above that I simply unplugged the ventilation fan motor? I went to a huge terminal facility that is off limits to the common folks. There are lots of security in this government facility and the guy told me that when I left the location 2 weeks ago, the Debit Credit Card reader does not work. I shrugged it off and said : “Of course it works”. I have to be careful on my tone of voice which sometimes my composure is off because of rushing to one location to another. Sometimes you can be bothered from so many locations especially towards to weekend. I said inside my head sorry for the statement and I do not mean it and was hoping the person would be not that sensitive and should have said: “OK, sir I will check it out and let you know” instead. Nowadays the populace seems to be extra sensitive in all aspects of things relating to anything. So I have to remember to keep my composure at all times. May the people in the locations I go understand the life of a vending machine business operator. You sometimes know the previous location someone was trying to harass you for freebies and prior to that an inspector almost ticketed you at a loading bay for more than 20 minutes and the location before that you are paranoid when you are parked at a location with people staring at your work van and snooping the minute you walk away from the work van. There are a lot of things that happens in one ( 1 ) day every day for me when I’m out doing the vending machine business. Probably deep breathing exercises should do the trick! Okay back the location that the guy told me the debit credit reader is not working. I tried my credit and debit card and indeed that it did not work! I was thinking maybe the there is some hardware and software conflict issues going inside the machine. This will be the isolated problem solving method that will come into play. 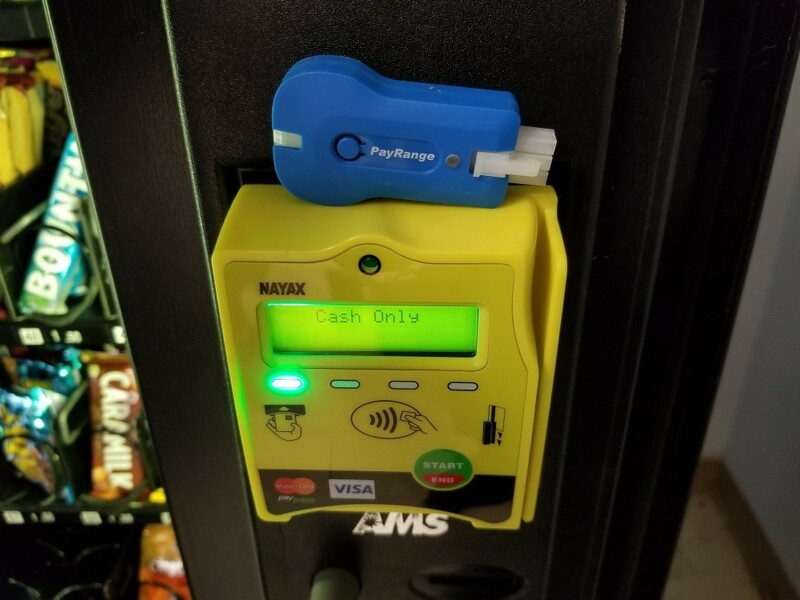 I removed the Payrange attached inside the vending machine and re connected the debit credit reader and tested out and everything is perfectly working. The Payrange is not compatible to Nayax. By the way Payrange is a device that uses your phone to buy from a vending machine. I took it out because some people do not like to install apps on their phone and load money to the app by disclosing the credit card details and opt for a TAP and GO easy device instead. I highly recommend the Nayax debit credit card reader even thou it costs $400 compared to the Payrange’s $85 since it is easy to use and as I have mentioned TAP and GO! Can even use APPLE pay, Android, Apple watch and phone. I even had remote emailed from the credit debit reader monitoring software that everything is doing great and sales have more producing for the debit credit Nayax device. I really do look forward to you posts and I enjoy reading them, you give a detailed description of your vending machine day to day running which is a big motivation for me. I understand the need to keep your composure even after you have been under immerse pressure from checking out other vending machine locations. And of course, much appreciation for letting your readers know the types of problems that they can encounter of they happen to want to venture into your line of business. Thanks for sharing. yes, actually the purpose of this website is quite unique. This site is the actual hands-on inside information on how locations are treating you as a vendor and how to run it as a full-time business.